A group of 16 agents from Vision Travel completed an exclusive Certified Sandals Specialist workshop at their branch in Waterloo, Ont. on Sept. 15. Providing useful and up-to-the minute information, the session was extremely important in advance of the busy fall-winter season and will help the Vision agents elevate their success even more in selling Sandals and Beaches Resorts. 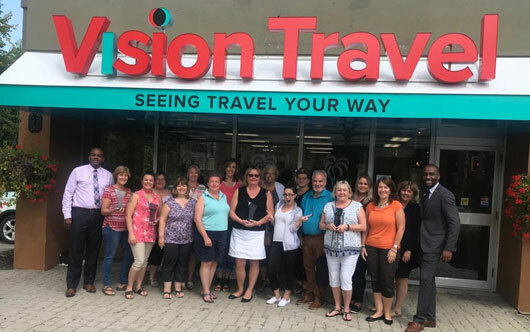 Already one of the top performing agencies in Ontario, Vision Travel was also presented with their four trophies from the 2017 Sandals STAR Awards including: Best of The Best Agency – Canada; Top Sandals Booking Agency – Ontario; Top Beaches Booking Agency – Ontario; Top Club Sandals Travel Agency – Ontario. Pictured with the team from Vision Travel are Robert Smith (l), business development manager, Eastern Ontario, Unique Vacations Canada, and C.J. Smith (r), national business development manager, Unique Vacations Canada. Also in attendance, but not pictured was Teresa Villanueva, inside sales manager, Unique Vacations Canada.